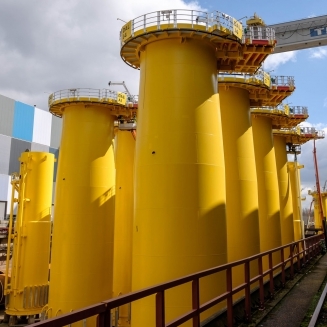 Smulders produced the 67 transition pieces for the Dudgeon Offshore Wind Farm. The Dudgeon Offshore Wind Farm is built at the coast of Norfolk, in south-east England. The wind farm comprises 67 monopile foundations on which 6 MW turbines will be placed. This high capacity turbine makes these transition pieces the largest that have ever been produced in our facilities.